More than 50 percent of lost time workers’ compensation costs involve physical medicine, such as physical therapy and occupational therapy. This type of treatment – when over used - amounts to time you can’t get back, and an OSHA recordable outcome that will cost you down the line. The publication is authored by Heather Jackson, who has been a freelance writer for the past 7 years, specializing in the health and wellness industry. She currently works as a content specialist at Axiom Medical, bringing awareness to employee health issues and industry trends with social media content, blog posts and white papers. To view her latest content on workplace safety and employee health, visit the Axiom blog. 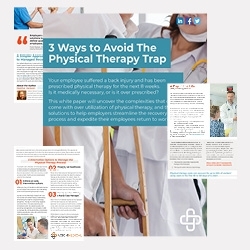 You may download a free copy of “3 Ways to Avoid the Physical Therapy Trap” through the following URL: https://info.axiomllc.com/3-Ways-To-Avoid-The-Physical -Therapy-Trap. Founded in 1999 and headquartered in The Woodlands, TX, Axiom is a market leader in the occupational health sector in North America, with unrivaled service quality and a very strong return on investment for clients in the USA, Canada and Mexico. For more information, please visit the company’s website at https://www.axiomllc.com.